Together with our experts and consultants, we begin to identify, research, examine, estimate, adjust and appraise the overall value of our client’s property loss. Property damage from major disasters or household appliances can cause serious damages to homes, condominium units, and rental properties. Our professional expertise as a former insurance company claim insider and many years of insurance claim experience will facilitate the communications with the insurance company about your claim. On the policyholder’s behalf, we speak the insurance company’s language. Our specialty is understanding the impact of the fine print of the insurance policy and seeing through the mist. You, the policyholder, are assured that your interests are protected. The insurance company employs its own adjusters to protect their interest. Allow us to protect your interests. This will empower you! We are the exclusive representative for the policyholder. It is our business to work toward a more favorable settlement on your behalf. If you’ve had fire, water leaks, flood, mold, wind, hurricane, tornado, hail, collapse, car hitting a building, vandalism, theft, sink hole, property damage to your home, condominium, or rental property, Call Gold Coast Public Adjusters Now! 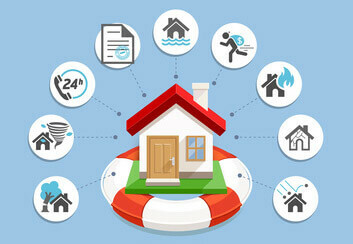 It is important to assess the cost of the damage to your home and property before filing your home insurance claim. Filing a claim can cause your home insurance rates to increase, even if the claim is small. If you do not have significant damage to your home, get a repair estimate and consider paying the bill without involving the insurance company. Keep in mind that you will have to pay your deductible before the insurance company pays a claim, so you won’t necessarily be losing money by paying for small repairs.